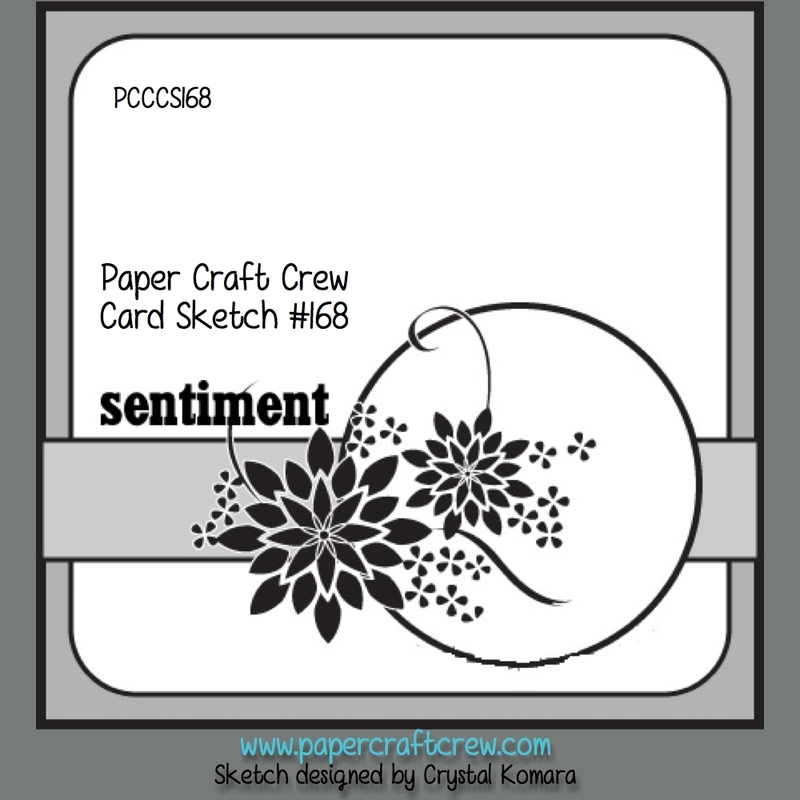 Welcome back, stamping friend, to another challenge with the Paper Craft Crew! 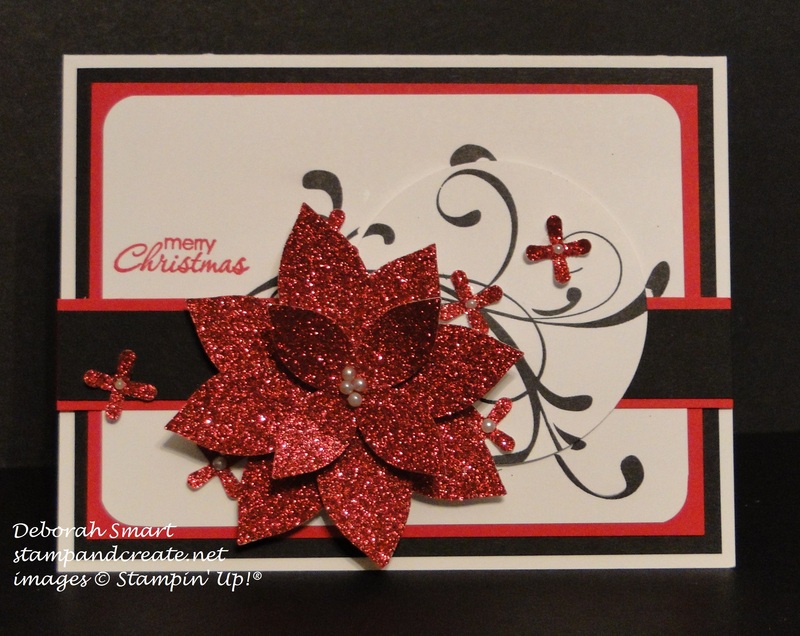 I knew that I wanted to use the gorgeous flourish from the stamp set Everything Eleanor, and the Festive Flower Builder Punch for the focal image. I started by layering a 2 1/2″ circle of Whisper White cardstock over a 3 1/2″ x 4 3/4″ panel of Whisper White cardstock. I stamped the flourish in Archival Black ink several times, making sure I stamped over the punched circle onto the white panel. After rounding the corners using the Project Life Corner Round Punch, I layered the Whisper White panel onto a piece of 3 3/4″ x 5″ Real Red cardstock, and layered that onto a piece of 4″ x 5 1/4″ Basic Black cardstock. I then layered the strip of 3/4″ x 5 1/2″ Real Red vertically across the bottom 1/3 of the card, with a 3/4″ x 5 1/2″ piece of Basic Black on top of it. Over that, I layered the stamped 2 1/2″ stamped circle, lining up the stamped pieces, then added the flower punched from Real Red Glimmer Paper, punched using the Festive Flower Punch. I also scattered the small ‘x’ shaped pieces randomly onto the card, and place a small Pearl Basic Embellishment in the middle of each one, and 4 in the middle of the main flower. The sentiment is from the Petite Pairs stamp set,stamped in Real Red ink, to complete the card. The card base is made from the Thick Whisper White cardstock; it’s very sturdy, which is perfect for holding up this layer-heavy card. I would definitely make a special envelope or box for this card; I don’t think it would hold up to mailing in a regular envelope very well! Next Next post: Bling it On! !